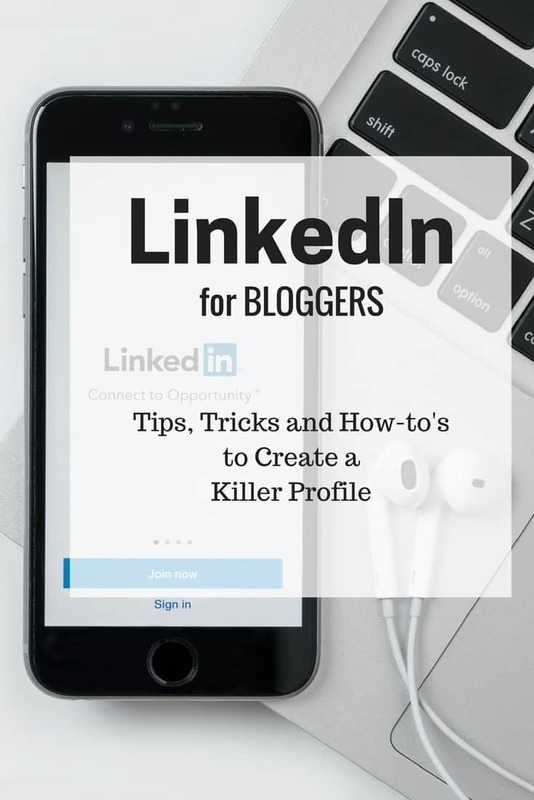 It doesn’t matter if you are a full-time or part-time blogger, it’s critically important to have a LinkedIn profile. As the blogging industry continues to mature, it has become a recognized profession. By having a presence on LinkedIn, you are treating your blog and your brand as a business. And you will have greater visibility and more opportunities. I’ve worked in social media professionally for close to a decade. I’ve trained over 800 employees at companies that I have worked to effectively use LinkedIn. I recently realized that there are quite a few bloggers out there who are either not on the platform at all or haven’t optimized their profile and my mission is to educate as many bloggers as I can on what they are missing out on! Before I get into the tips and tricks for setting up a proper LinkedIn presence, I wanted to share some reasons why you should have a profile in the first place. Sure recruiters and employers are on LinkedIn, but you know who else is? Brands. Specifically the PR folks from those brands and/or their agencies. They are always looking for bloggers to work. The people hiring bloggers are on LinkedIn. You should be too. There is a legitimacy that comes from having a LinkedIn profile. It’s validation that you are on the top of your game and know how to act professionally. 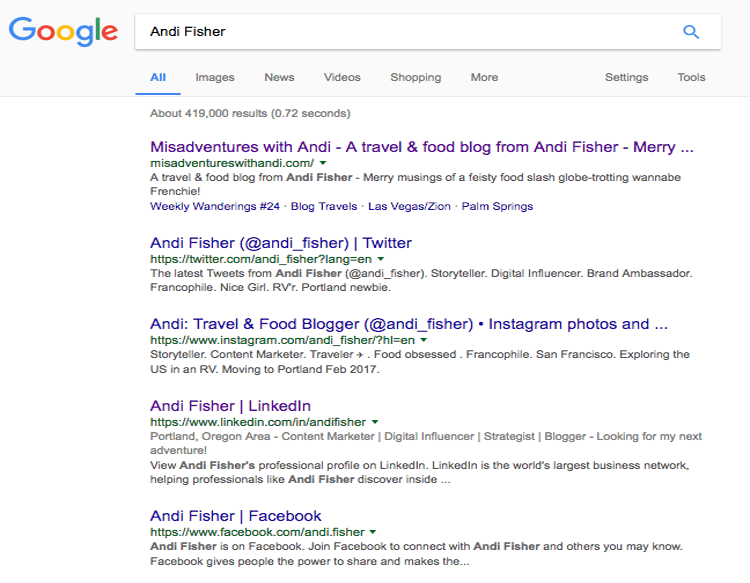 If someone Googles your name and you have a LinkedIn profile, it is generally going to show up in the first 5 search results. (It’s really great pushing down results that you may not necessarily want others to see.) Also, it feeds into that trust thing, having a LinkedIn search result makes you more credible. Having a LinkedIn profile that communicates the work you do shows your expertise. It demonstrates your proficiency and subject matter savviness. When we get to advanced techniques, I’ll share how you can show your prowess even more. All this is part of building your personal brand. Holy heck are bloggers good at networking! Social media is in the blood and LinkedIn is just another social media platform. (Although there are some characteristics of the platform that you will want to be wary of, and I’ll explain them.) 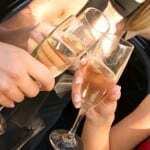 Take those same mingling skills and build a network of people to tap into. 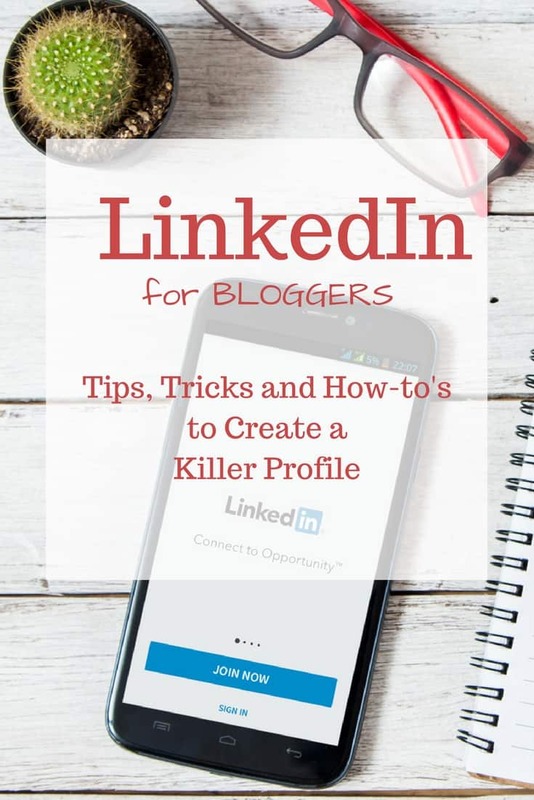 Now that I’ve shared a few reasons why you should have a LinkedIn profile, I’m going to tell you how to create a killer profile page. The first thing you should be aware of BEFORE making any profile edits is that you should turn off Broadcasting. You don’t want to fool around with your profile with your Broadcasting turned on. Otherwise, your network will be spammed with messages like: “Andi Fisher changed her headline.” “Andi Fisher updated her employment.” “Andi Fisher uploaded a photo.” “Andi Fisher no longer has a network because everyone got tired of her broadcast spam.” Right?! To turn off broadcasting, please do the following: In the top navigation bar, click on the “Me.” A drop-down menu will appear. Under “ACCOUNT”, click on “Settings & Privacy.” Once you get to that page, click on “Privacy” in the center of the page. Find “Sharing Privacy Edits” and make sure it is set to No. If it is not, click on “Change” and set it to No. The first thing we are going to focus on is the most important part of your profile page, the intro box. It contains your image, your headline, and your summary. Upload a good picture of yourself, maybe something that you use on other social media networks. It should be somewhat professional, meaning not a shot from a wedding or group night out that you got dressed up for, but rather a nice sharp headshot. You can take one with your cell phone. Try to find natural light, simple background and make sure you smile. By default, LinkedIn will populate the headline with the title from your most recent job. People who leave the default title are missing out on search exposure. Your headline is what shows up in LinkedIn search results. Using keywords in your headline will communicate so much more than a title. Do some brainstorming as well as searches in LinkedIn to find keywords that describe you. This is your elevator pitch. Your 30-second window to tell people at a high-level why they should be interested in you. If you can do that in two sentences, great – that’s what people will first see when they land on your profile. If you have more to say, that’s good too, but try to capture their attention in the first two sentences. Congrats! You’ve completed your Intro Box. Now onto your professional experience, listed in the Experience Box. 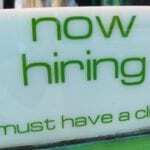 If you have a full-time job that is not blogging you are likely to already have listings here. If you don’t, add them! This is the area where you should add your blog. Add a new entry and include your title (Blogger or whatever title you use), your blog name, a brief description of your blog, and how long it’s been in existence. If you have a media kit or link to a portfolio, add it here as well. There is lots of additional information that you can add to your LinkedIn profile (education, clubs, certifications, etc.) 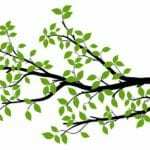 and you should populate your profile as completely as possible, but the sections that I have described above are the absolute minimum, along with these two final items: your urls and your background image. 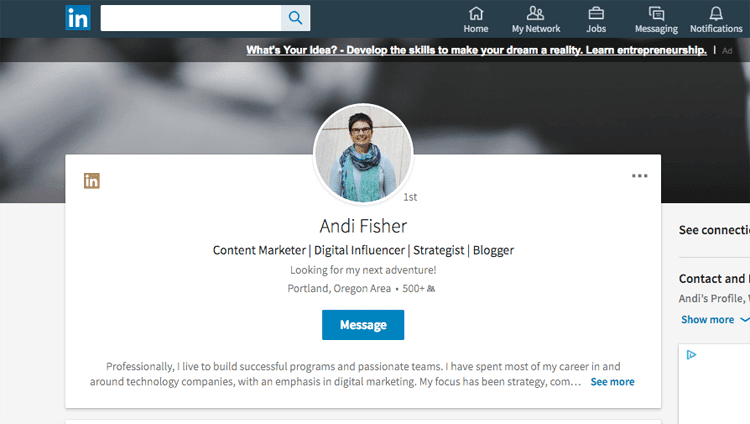 When you create a LinkedIn profile, you’re assigned a profile number that shows up in your profile url. It isn’t pretty. If your name is common you may have to play around with adding your middle initial or dashes, but you should get to something that looks a lot cleaner than https://www.linkedin.com/in/tami-qualls-59433312b/ (I’m picking on my virtual assistant because (a) she knows I mean no harm and (b) I’m going to help her fix her URL! The next URL you need to add is to your blog. Back on your main Profile Page, on the right-hand sidebar, scroll down until you see “Contact and Personal Info.” In this section, you can add your blog to the area where it says “Website URL.” Paste in your full URL (http://www…) and in the drop down to the right, select “Other.” In the field below, type in a description for the URL. If you have multiple sites or another online presence like an About.me page, then take a moment to add them. You can also add your contact email address and your Twitter profile. Do not add your birthday. You have now got almost everything you need to promote yourself and your blog. One additional aesthetic or branding feature you can add is your background image. You can upload any image for your background, however, the optimal size is: 1536 x 768. A couple of things to note: it should be simple, if it is too busy it will distract the visitor from the important information on the page and most of the image will be blocked by your actual profile. So if you have something important that you really want to communicate, you need to ensure it is in the space either to the right or left of the background image. Adding a background image isn’t totally necessary; the default image from LinkedIn is a nice blue. It’s just a nice to have. Viola! You should feel really good about having a solid LinkedIn profile. But there are a couple of more things you can do to make it really killer. These are a little more advanced, but not difficult to do. Before I give you the final three things you can do to put your profile over the top, I want to say one word about connecting. If a PR person reaches out to you to work on a project via your blog, another social media channel or email and you end up working with them, you should connect with them on LinkedIn. You will start building an incredible network of PR people who have personal experience with you. Other PR professionals will see that you are connected with their peers and colleagues and it is a great bump for you if someone is considering working with you even though they have no experience with you. They see that you are connected with others in the industry and you look like a pro! All three of these techniques will create social proof and make your profile stand out. Endorsements are a list of skills you master that people have endorsed you for. People can suggest a skill and give you an endorsement for that skill, or you can add a skill yourself and people can endorse you for it. It’s basically a +1 or a Like in agreement that you master that discipline. The list allows potential employers, recruiters, and PR professionals to see what your expertise areas with the added value that other people have agreed as well. These take more effort on the part of people. Testimonials are written statements about how great you are. If you work with a brand on a project and it is an overwhelming success, consider reaching out to the brand once the project is over and asking for a testimonial. If you work as a VA, ask a few of your clients to offer a testimonial on your work. Same if you do graphical design for bloggers, etc. Share content that you curate or write to your newsfeed. Part status update part social media post when you share content you are top of mind. Word of caution: this is a professional network, so you should really only share content in that realm. Blogging how-to’s, networking tips, small business experiences, and other publishers’ content about these topics are all good things to share. 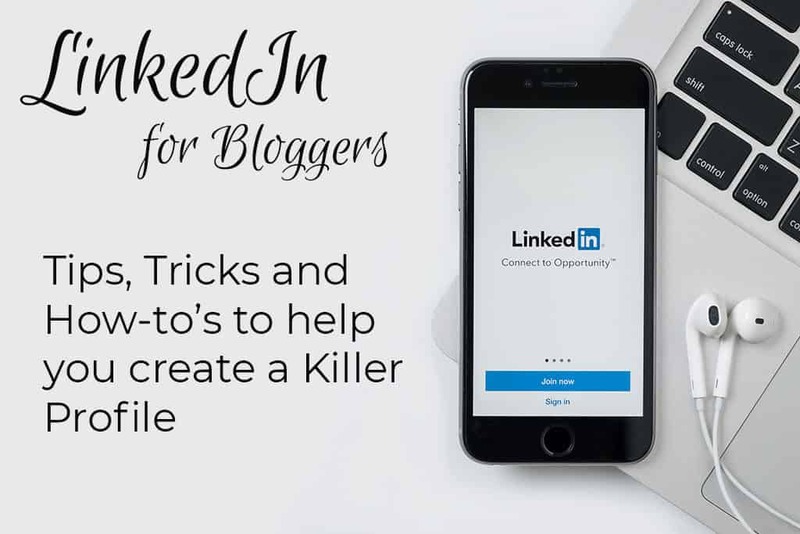 With these three techniques, plus a killer profile, you will go a LONG way to creating a professional, branded LinkedIn presence that will help you to connect with others. It will bring you greater visibility for influencer projects and freelance work and you will build a working network of individuals who can give you a leg up when needed. You can see all these things in my own LinkedIn profile, I welcome you to check it out and connect! I also help bloggers out with their own LinkedIn profiles. How about you? Any LinkedIn questions I can answer for you? Thanks for the tips you have provided here. I have a Linked In account but, to be honest, I don’t feel I’m yet using it effectively. This is very useful for me. Thank you so much! Thank you for sharing these excellent tips! This article was extremely helpful.